The WDP1001 displays your treasured photos and memories with incredible clarity. Your photos are shown with remarkable image quality, in rich and vibrant colors. See the texture on a leaf, individual bricks of a house, or freckles on a face - everything that lets your photo tell the story of a captured moment. Fast processor: View thousands of photos and videos from your inserted USB stick or SD/SDHC card. 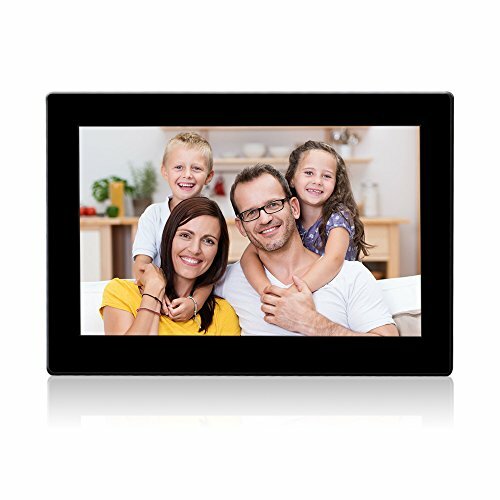 The WDP1001 frames turns on when you enter the room to display the most recent photos & videos and turns off when you leave. For the ultimate convenience, the WDP1001 frames allows you to set the frame to switch off after sensing no movement for 5 minutes up to 1 hour. The perfect gift to bring a smile to loved ones: Capture moments and display them instantly using the Mobile App for iPhone & Android or email them directly to the Wecool WIFI cloud Frame. Remotely view and manage the photos on your frame using the Mobile or Web App. All your photos in one place: Access all your favorite photos on Facebook, Instagram, Dropbox, Flickr & Google Photos or upload new ones to create dedicated playlists on the safe and secure free Web App. Allow friends and family to share photos to the Wecool Wi-Fi cloud Frame from anywhere in the world. If you have any questions about this product by Wecool, contact us by completing and submitting the form below. If you are looking for a specif part number, please include it with your message.